With more than 100,000 Facebook fans, social media enables PAIRS Foundation, an industry leader in relationship and marriage education, to share lessons with a global audience. Virginia Satir, honorary founding chairperson of PAIRS Foundation and pioneering family therapist, said it best in the 1980’s – long before the Internet and social media became a ubiquitous presence in our homes – when observing that wherever she traveled in the world, people’s hearts were in the same place. There could be few better testimonials to Satir’s reflections than the legions of people from across the globe who have become fans of PAIRS Foundation on Facebook. 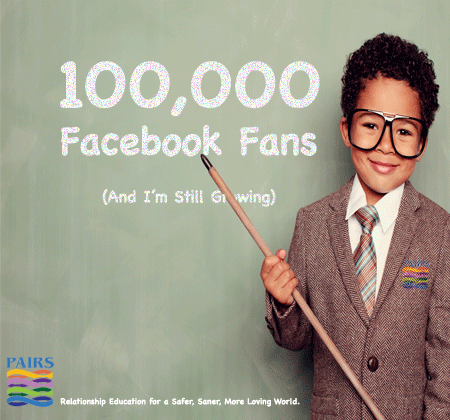 This weekend, PAIRS Foundation, a longtime industry leader in relationship and marriage education, reached a milestone when the number of people connected to the Hollywood, Florida-based nonprofit on Facebook broke 100,000 – an achievement shared by less than one percent of the more than 42 million pages and one billion active users of the leader in social media. “Our 100,000 fans share a common commitment to love, family and relationships that are the foundation of life,” said Moeed Ishrat, the company’s Outreach Director. PAIRS CEO Seth Eisenberg said the group’s social media experience is similar to what he’s found in classes taught in person to thousands of people. Messages such as this post from PAIRS Foundation’s Facebook page are routinely viewed by more than one million people, shared and liked by thousands. “When it comes to relationships, people do the best they can based on what they know. There’s a universal desire to know more about how to sustain love, which includes better understanding ourselves and each other, improving communications, and learning how to negotiate differences in ways that bring us closer,” Eisenberg said. To celebrate the milestone, PAIRS Foundation is inviting Facebook fans to submit their personal love stories and pictures for the PAIRS Love Story Contest. Top entries in categories such as couples, parenthood and family will be featured on the group’s Facebook page with the winners sharing $1800 in prize money. Ishrat said details will be announced this week on Facebook.